Everyone needs a good, solid sweet potato recipe for Thanksgiving. And while I’ll never say “no” to marshmallow-topped anything, if I’m going to eat sweet potatoes, I prefer to let them take center stage. 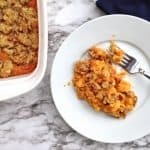 My family’s easy sweet potato casserole is filled with creamy sweet potatoes and baked with a flour, butter, & brown sugar topping. And even though we serve it alongside all our other Thanksgiving sides like green bean casserole, creamed corn, and baked squash, it’s basically a dessert, but let’s not tell anyone that, okay? **I’m stepping up on my soapbox to say that what we label “yams” in the US are really just sweet potatoes. Real yams are completely different and are eaten in West Africa and in the Caribbean. 1. Drain your canned sweet potatoes. Mash them and mix together with brown sugar, butter, eggs, vanilla, and evaporated milk. 2. 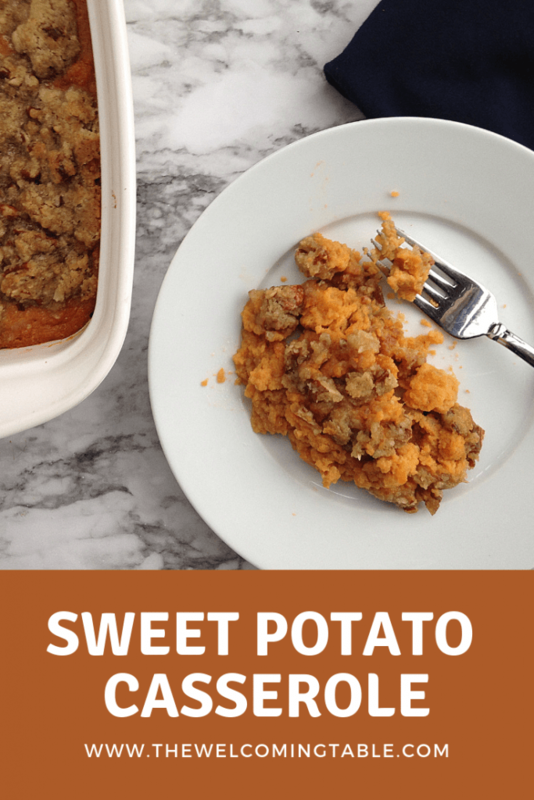 Mix the topping ingredients and sprinkle on top of the sweet potatoes evenly. 3. Bake at 325 for 25 minutes. Easy peasy. 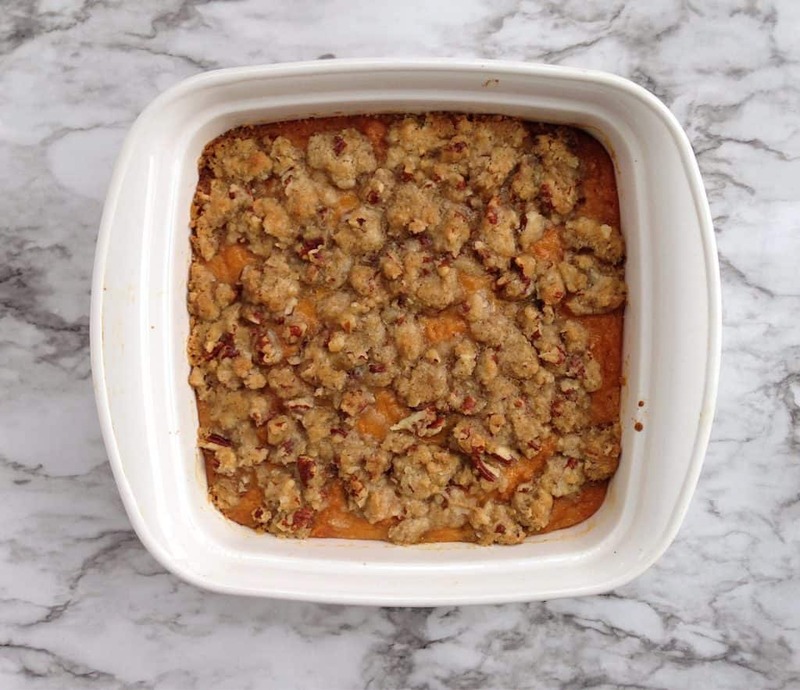 Dig in and enjoy the sweet, brown sugary goodness that is Sweet Potato Casserole. If your casserole isn’t quite set in the middle, just stick it back in the oven for a few more minutes. All you need to make these sweet potatoes is a large mixing bowl, a potato masher, and a casserole dish. Serve Sweet Potato Casserole with roast turkey, glazed ham, or any southern meal. 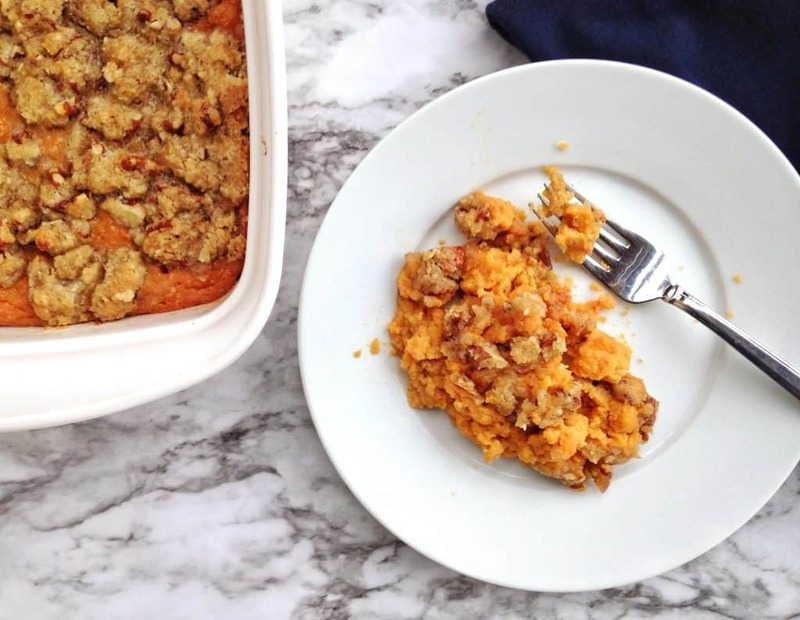 Creamy sweet potatoes baked with a brown sugar topping. A delicious, southern classic. In a large bowl, mash sweet potatoes with a potato masher and mix together with the brown sugar, butter, eggs, vanilla, and evaporated milk. Spread in a greased baking dish. Mix topping ingredients and evenly sprinkle on top.